As patients we’re fixated on how often IVF will work and while doctors have their own definition (for example, does an embryo “implant,” was a heartbeat seen on ultrasound) we think the bar is simple: IVF success means a baby born alive after an IVF cycle was started (with the cycle start marked by beginning medications to stimulate the ovaries). The likelihood that any given IVF cycle leads to a live birth largely depends upon the age of the woman whose eggs are being used during IVF. Below are the IVF success rates across the US reported by 95% of clinics. 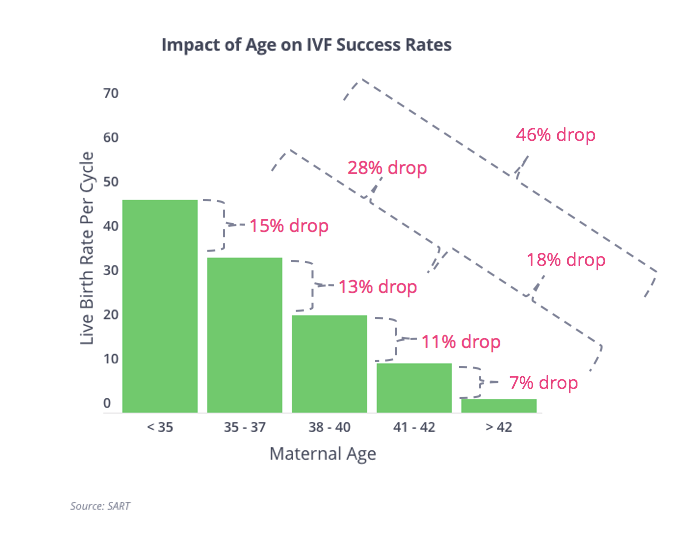 As you can see, most IVF cycles fail even for the youngest, healthiest patients. Delaying treatment imposes a penalty that increases depending upon how long someone wait. 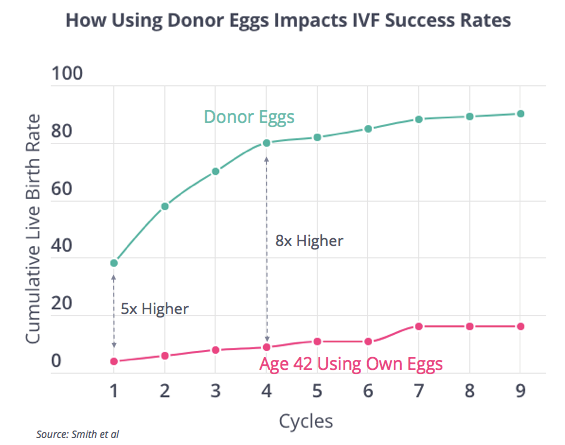 At the extreme, waiting say seven years, takes the odds any given IVF cycle will work from a coin-toss (about 48%) to the remotely likely (2 - 4%). As a result, most patients need to undergo multiple cycles, and as we pointed out in a another lesson, no cycle is as likely to succeed as the first one. 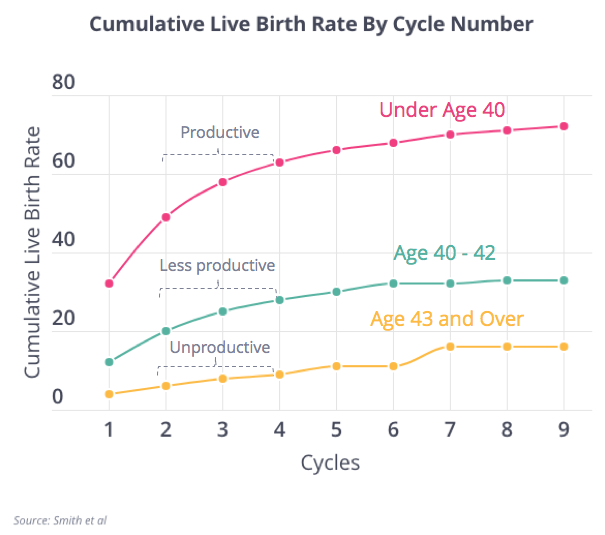 Below is data out of the UK published in the Journal of The American Medical Association that illustrates that after a few cycles most younger patients succeed with IVF but that is not necessarily true for older patients. 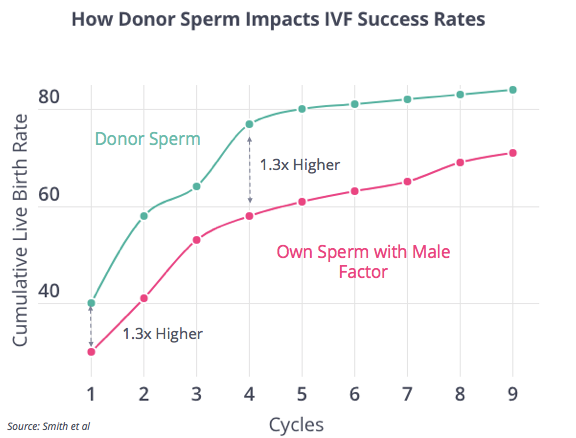 While it can be painful for patients to consider, using donor eggs or donor sperm during IVF can dramatically improve the odds an IVF cycle will work, as you can see below. The same is also true when a surrogate is used with success rates hovering around 70% per cycle. A patient’s underlying condition (e.g. endometriosis, PCOS, male factor) can play a role in the odds of success with IVF, but to a lesser extent than many believe. 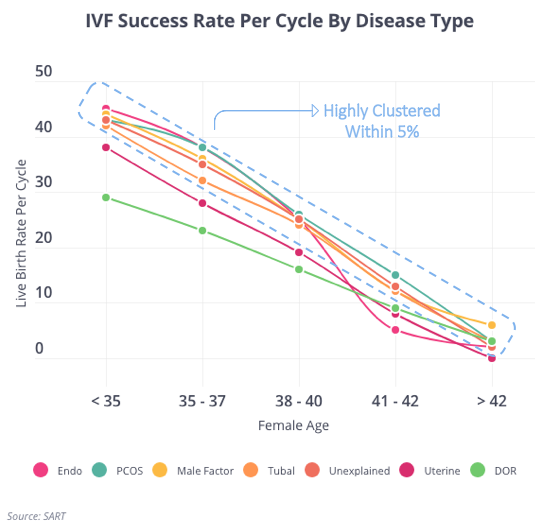 Below we’ve mapped out success rates nationally for the 8 most prevalent infertility conditions and, as you can see, 6 of the 8 have success rates within 5% at every age interval. The same phenomenon persists after 3 IVF cycles though the cumulative odds of success band is slightly wider (10% vs 5%). 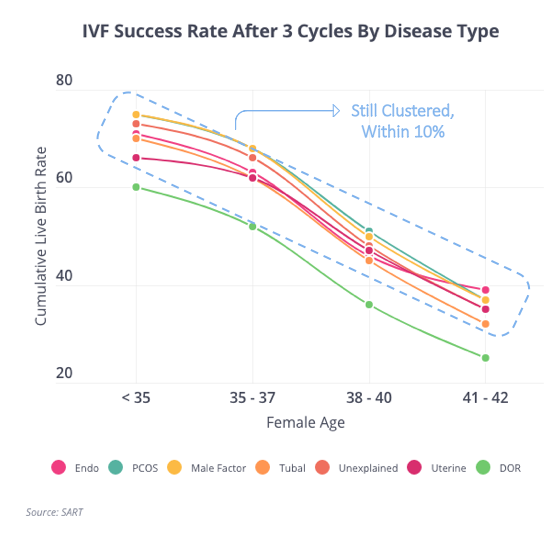 That said, there are sub-groups of patients who consistently have lower rates of success with IVF. The most obvious group, as you can see in the above two charts, are women with Diminished Ovarian Reserve (DOR), but they’re not the only group and we’ll explain why certain groups tend to lag the pack. Diminished Ovarian Reserve: Women with a low volume of eggs can still benefit from IVF, but as you can see, the process is less efficient. The challenge here is that women with DOR produce few eggs, even when heavily stimulated, and so they often require multiple IVF cycles to produce enough eggs to get one that will turn into a chromosomally-normal embryo. When women produce as few as three eggs per retrieval some data supports trying new protocols or “adjuvant” drugs and fertilizing the eggs with Conventional Insemination (instead of ICSI). Severe Male Factor Infertility: In the case where men produce no sperm and there is nothing blocking the sperm’s progress (this is known as non-obstructive azoospermia, or NOA), IVF success rates are low. In this case, sperm needs to be surgically retrieved from the testicle (as opposed to being ejaculated) and often few can be collected. As a result, eggs must be fertilized with ICSI. 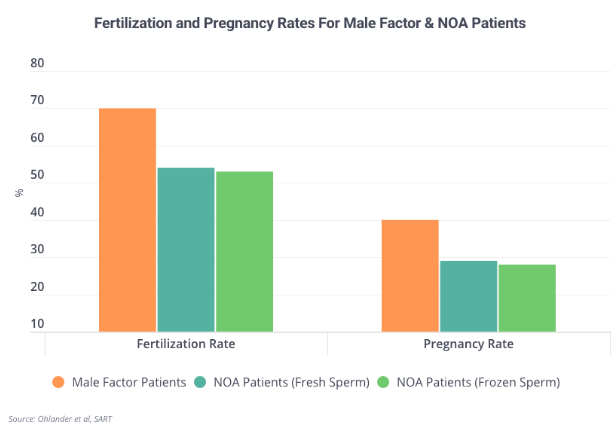 While IVF success rates for these men lag success rates for men with milder male factor issues, IVF for patients with NOA can still lead to pregnancies. Ultimately, whether fresh or frozen / thawed sperm is used appears to make little difference from an outcomes perspective. True uterine factor: For a woman to conceive, an embryo needs to implant in the uterus. When there is a major structural anomaly in the uterus, it becomes harder for an embryo to implant. Unfortunately, IVF does little to address this and, as a result, women with structural issues suffer higher rates of non-implantation, or miscarriage, after IVF. Typically, surgery must be done beforehand and even then the results vary depending upon the nature of the issue. Recurrent Pregnancy Loss: If a woman suffers from multiple miscarriages, and it’s clear that the embryo was chromosomally normal (for example, because it was genetically-tested before transfer or the “products of conception” were tested after miscarriage), doing another IVF by itself probably won’t yield a better result. In such cases, it’s likely that there’s some undiscovered factor that’s driving the succession of miscarriages and since IVF probably won’t address it, doing more cycles fruitless. Until the underlying culprit is discovered and treated, the value of doing more IVF is probably low. Again, in circumstances like diminished ovarian reserve, non-obstructive azoospermia, uterine defects and repeated miscarriage, often solutions like using donor eggs, donor sperm or a gestational surrogate dramatically buoy success rates. These options are not cheap and can be emotionally-difficult to arrive at, but they have generally superb success rates (as we showed above) and the data shows these parents come to love their children as much as other parents.